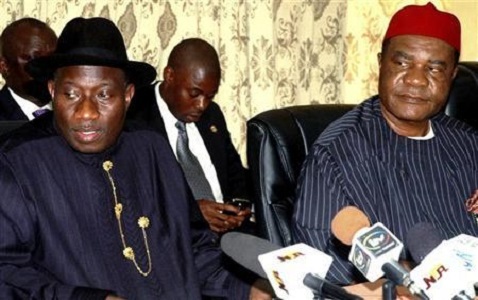 Chairman of Peoples Democratic Party, PDP, Chief Vincent Ogbulafor, has blamed the party’s crisis on former President, Dr. Goodluck Jonathan. He also said PDP had a zoning pattern that had worked for it in the last 16 years, stressing that the best thing Jonathan should have done was to support a northern candidate in 2015. Ogbulafor said: “The person who caused the failure of PDP is Jonathan. PDP had internal democracy, a zoning pattern which worked for them for 16 years, and we agreed at a meeting that power would stay in the North for eight years before it returns to the South for another eight years. “You will not say Yar’Adua ruled for eight years; not even for four years, because he was sick. The best thing Jonathan would have done was to bring a Northerner and make him President and agree that when he finishes, power will come to the South and if it is him again, then he will contest. “Doing that, the North will be happy; that was my feeling, and that was why I said that power is still in the North because we agreed eight years each for the two zones. “So that is where the power tussle began and that was the downfall of PDP. When we refused to follow our guidelines, we derailed and there was no more internal democracy. “When I said power would remain in the North, Jonathan did not like it and they made sure they unseated me. I left. That is when I knew that PDP was in for trouble, and that was when the diarrhoea started. “But it has happened: same Katsina State where Yar’Adua is from. “Immediately I left, Jonathan had five PDP chairmen in one year. It is unheard of and that is when the problem started, and it has continued to degenerate. When Tony Anenih, Chairman, Board of Trustees resigned, when Muazu resigned, I commended their guts and I said these men want PDP to survive because they quietly exited. “I advised then that the National Working Committee, NWC, of the party should resign because they had led PDP to failure, but they were more interested in the money they were sharing; they failed to heed my advice and that led PDP to where we are today. “I advised him not to touch the structure of governors. He went and tampered with the structure; that was when they said 16 is greater than 19. “So some solid governors left the party: people like Amaechi, Saraki and Wammakko. Those are areas where you get a good number of voters. When they left the party, what do you expect? The party, indeed, collapsed. “When I was PDP chairman, there was peace in PDP and I brought in four non-PDP states: Abia, Imo, Sokoto and Bauchi. Ogbulafor, however, said PDP would only survive if the leaders of the party decide to rebrand.